This will be a tentative, perhaps even, timid piece. You see, this is my first column since arriving in Dhaka. I shall be here for seven months and suddenly feel that I have to be, horror of horrors, tactful when writing about my perceptions. I still feel very much like an interloper and possibly will until June when I leave. However, I have been here for ten days and already have things I need to get off my chest naturally, though I shall do so as gently as my instincts will permit. (This is when I hope my fan base which consists of my parents, an uncle and three pals in Darien, CT will be aghast and beg me not to censor myself). A day after I arrived one of my closest friends, who happens to be the executive director of Streetwise, an organisation dedicated to providing Dhaka street children with hot meals, clothing and access to educational resources, invited me to a fair at the Australian International School. It was my first introduction to the politics of philanthropy in this country and a glimpse of how (certain members) of the upper class respond to the progeny of the pungent proletariat being thrust in their faces. It was, as a result, an emotionally complex afternoon. 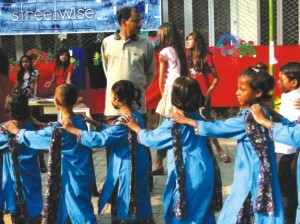 The children, for whom Aparna Muyeed, the director of Streetwise, had provided bright uniforms, entered the school courtyard smiling, and giggling with excitement. They held on to one another's shoulders and looked around, wide-eyed and curious. We were greeted by the principal of the school, who was harried and kindly. A DJ was blasting the latest hip-hop meets incoherent nonsense stuff that preteens and teens from the West Bank to the Upper West Side love--my God, I am aging, but whatever happened to actual music? And let me just add, my generation listened to Dr. Dre, give me the Chronic any day over this palaver, but the point is that the Streetwise kids started dancing. After some gentle urging from Aparna they marched into the middle of the small courtyard and started shimmying and jumping. They were uninhibited in the way children are supposed to be, oblivious to the stares and in some cases, visible, discomfiture and bewilderment of some of the students and parents. I must mention, however, that it was a parent who approached Aparna and suggested she bring the Streetwise kids to the fair and initiated the entire thing. After they danced for a bit the children were encouraged to look around the fair. For the most part the students at the school, save for a handful of incredibly active and involved kids one of whom will be voted most likely to succeed by her classmates seemed to ignore the Streetwise children. The children were let loose and most made a beeline for the soda table, where they fuelled up on coca cola. Aparna and I watched as they proceeded to get hopped up on caffeine and squeal with delight and run around looking at everything at the fair. There was a kind of bowling going on with filled plastic soda bottles and one of the teachers asked the kids to join. Two tiny girls, one of whom is named Moni, a child with a shaven head and tremendous joi de vivre (also a very innovative dancer, think Martha Graham or Twyla Tharp but Bangali), had waited patiently for their turn at bowling. They got to the head of the line and the father of a rather rotund young man took the ball, no, snatched it, out of Moni's hands and pushed her and her companion aside and handed his son the ball. He did it with an air of irritation and contempt. For me, it was, of course, shocking. But what was more heartbreaking was that Moni and her friend did not seem to mind at all. It was not a gentle push they were shoved, and they hopped away to the next interesting thing. Part of their reaction of course stems from the fact that they are children and don't process offensive behaviour the way grown-ups do but it occurred to me that this is their life: being shoved aside, shooed away like pests, their insignificance being emphasised again and again in million ways everyday. Their expectations of life are, and may always remain low which some Zen types would say is a good thing but not in this case. This is not about detachment, this is about their position in life which is low on the totem pole and over which they have no say. It is easy to be Zen when you know where your next meal is coming from. Besides all the practical results, raising their expectations, giving them the desire to want more or, more importantly, expect more out of life and know that they actually deserve more will be among the greatest things Aparna will achieve with her efforts on behalf of these children. It is easy to vilify the well to do in any country, or at least draw attention to their dissipated corrupt ways T’olstoy did it well, Fitzgerald too but they also showed their vulnerability and perhaps their lack of instincts when it comes to dealing with the less fortunate. As soon as I got over my self righteous shock at what I perceived to be the discompassion of many of the parents and students (I shan't elaborate on a decked out woman who actually tried to haggle with one of the students who was selling greeting cards on Streetwise's behalf. I saw how hard the principal and his equally kind wife who is vice principal of the school, worked to make Aparna and the kids feel welcome, as well as some of the teachers. Also, at one point three of the mothers started dancing with them, engaging and smiling and being affectionate. In the end the students, the parents and the efforts of the principal and his wife raised over one hundred thousand takas for Streetwise. And the only person scarred by complexity of the third world events of the afternoon was me. So, in the final analysis, no damage done.